It is recommended by the American Academy of Pediatric Dentistry (AAPD) that a dental home be established for an infant by the age of 12 months. The purpose of this is to institute preventative measures against dental decay and assist with choosing good dietary habits along with providing proper oral hygiene instruction for the primary teeth that are erupting. In years past the recommendation was for a child to be seen by a dentist at the age of 36 months; however, it was changed due to the fact that in some children dental decay was already prevalent. 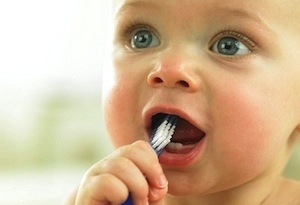 A child’s gingival tissue (gum) should be cleaned with a soft cloth or soft infant toothbrush and water. Once the 1st tooth erupts oral hygiene should start. By cleaning the teeth as they erupt it will aid in reducing bacterial colonization. Oral hygiene is one of the best ways to starting a child out with healthy oral habits along with decreasing risk of dental decay. It is of upmost importance to find a quality dental home for your child by the age of 12 months to have a formal preventive care plan that can decrease the risk of dental disease. By the dental office educating the parent and/or caregiver on an infant’s oral health on bacteria transmission, injury prevention and importance of having regular scheduled visits at appropriate intervals, plays an important role in maintaining a healthy child.